Happy May everyone! Hope your weather is great...I know it's been crazy in a lot of places. Today, I have two Mother's Day cards to show you, that I am sending out to my Mother and Mother In Law. 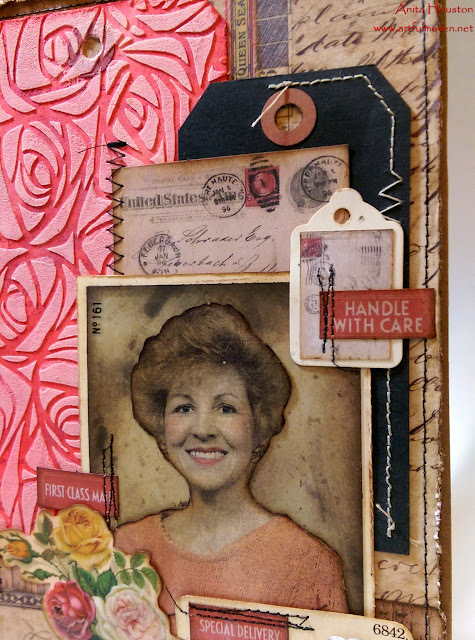 I usually make them cards extra feminine style, but this time I wanted a more vintage and almost masculine look, minus the roses. I LOVE the way they came out, and hope they do too. I dug through my stash and found some of Ranger's Perfect Pearls Powders...remember those?!! It's always great to mix new product with the old. That's how to use up your stash so you can buy more! 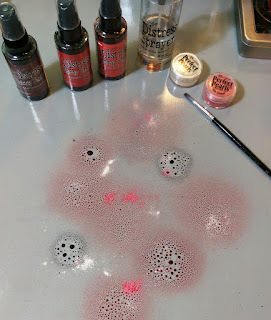 ;0) I misted my craft sheet with Tim's Distress Spray Stains in various red tones, and then added Pink Bubblegum and Perfect Pearl to the mix. I misted water on this, and then drug several tags through one time. The sheen on the tags is fabulous. I wish you could see it. 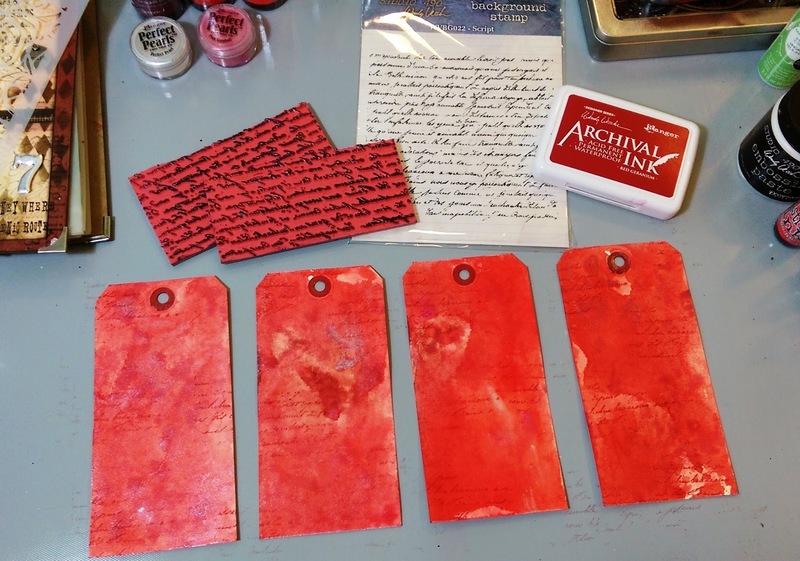 I stamped Wendy's Script stamp randomly on the tags with her Red Geranium Archival. I cut the stamp in two, in case you are wondering, to have for classes. 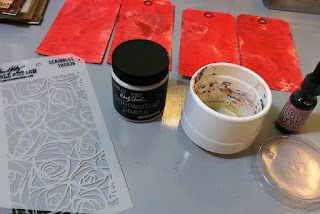 I mixed up a few drops of Tattered Rose Distress ReInker with Wendy's White Embossing Paste to tone down the brightness of the white. Then I scraped this over Tim's Scribble Layering Stencil, which looks like roses to me. You see that white cup? I got this over two years ago on the Italy trip with Tim. It had a to go cappuccino in it, and I've used it ever since to mix up embossing pastes with color. Cool huh?!! 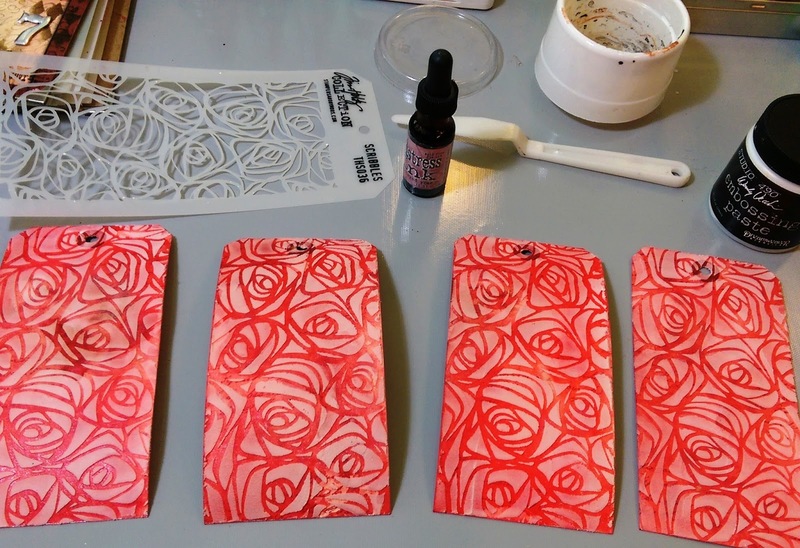 I inked the edges of the tags with Red Geranium. 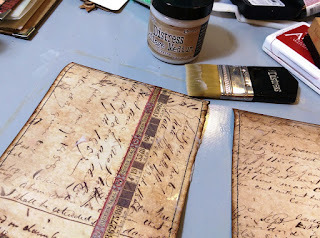 The shimmer and script coming through is wonderful. I used two for this project, and will save the other two for another day. 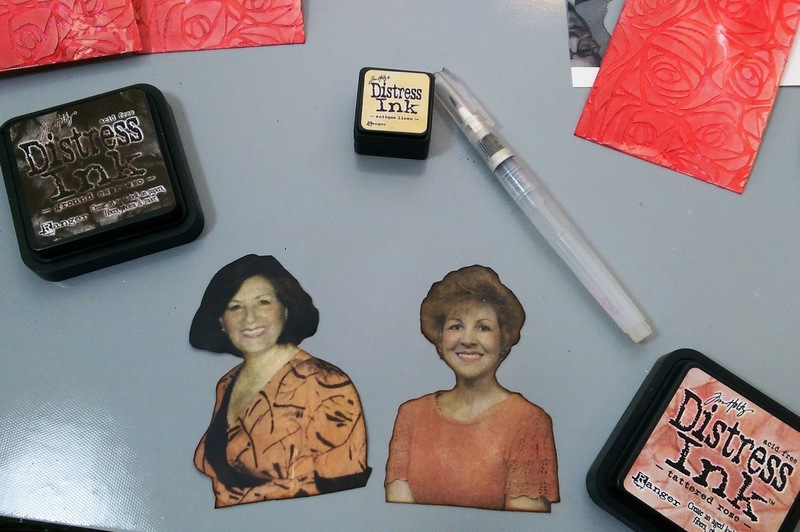 I made copies of some older pictures of the mothers, and printed them out in a sepia tone. 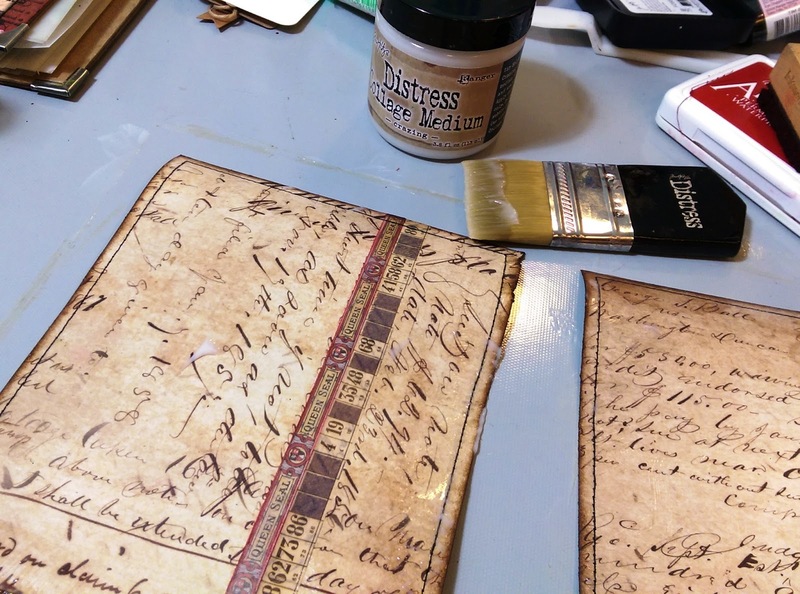 I used some Distress Ink and a water brush to add color. Then I mounted these on brown distressed paper (Tim's), and tried to give them an old passport photo look. 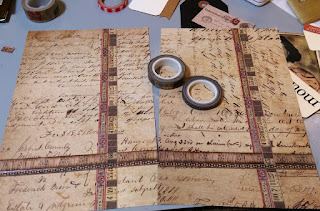 I used paper from the Dapper and Correspondence stash to create the background, as well with a little Tissue Tape. 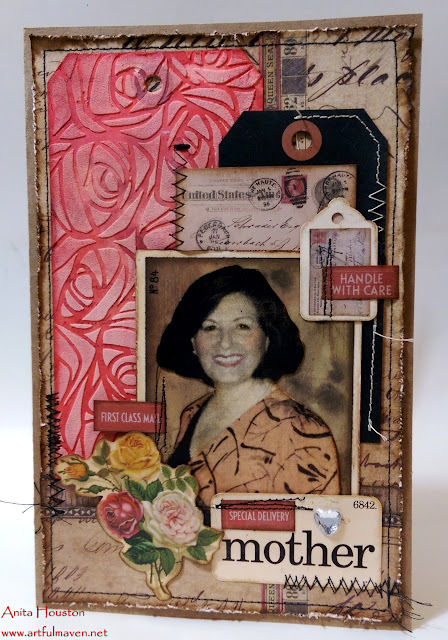 I coated this with Crazing Distress Collage Medium for a really cool vintage look. 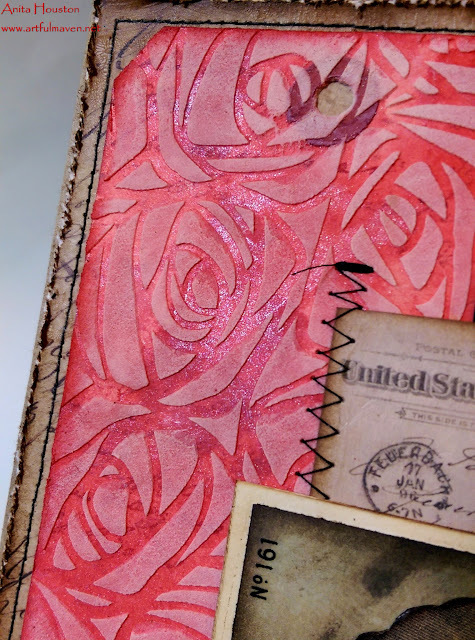 Then I started to add lots of ephemera, and lots of stitching, followed by Remnant Rubs, and a Mirrored Heart. Happy Happy Mother's Day to all of you out there with babes. I hope you are pampered and loved where ever you are! these are mindblowing gorgeous!!! i absolutely love love love them!!! 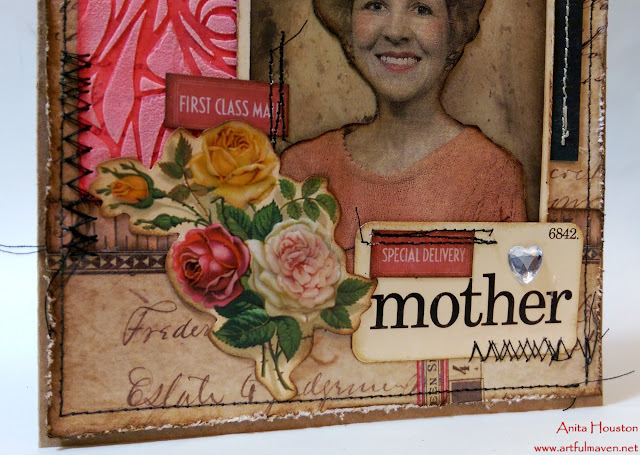 happy Mothers Day to you! 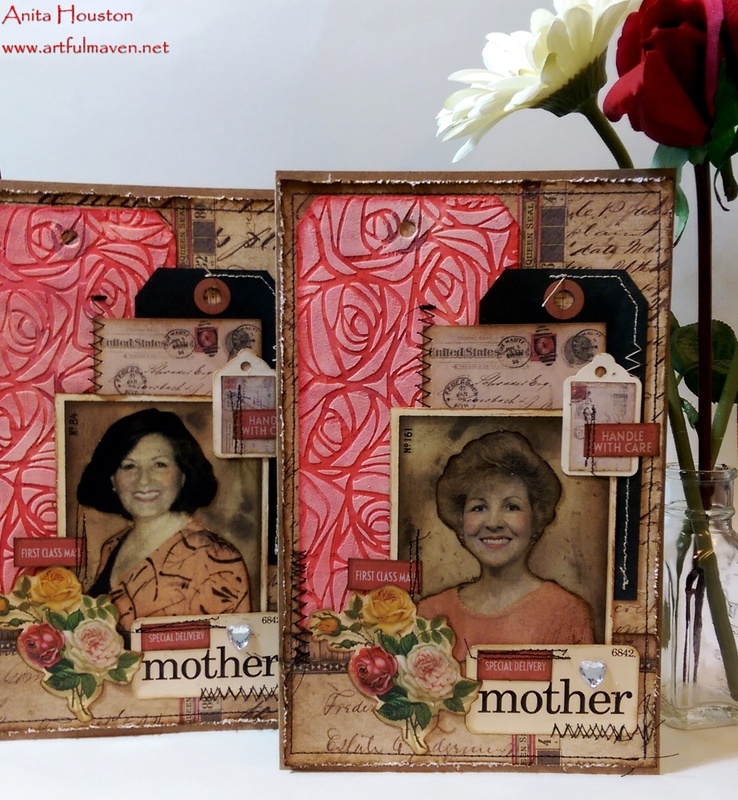 Antita, those are such wonderful Mother's Day cards. Just love every detailof it, they will love it too.Enjoy! I really LOVE these Mother's Day cards!!! the red/pink tags are absolutely beautiful!!! These are absolutely stunning. I can't stop staring at them. Thank you for the tutorial. Looks like you had fun with this! Love all the layering. Wishing you a very Happy Mother's Day! These are really beautiful! I love how the photos just blend right in! Happy Mother's Day to you! 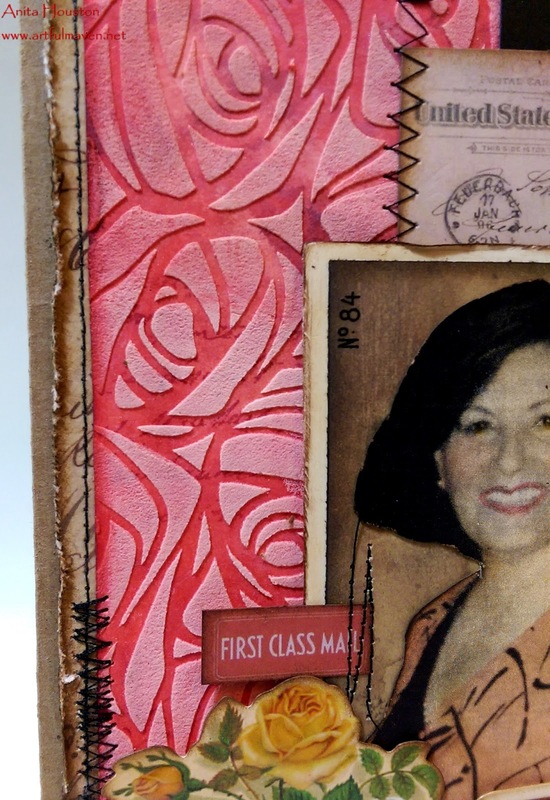 Anita, your Mothers Day cards are gorgeous. Sorry I did not see them sooner. You did such a beautiful job of collaging elements together. 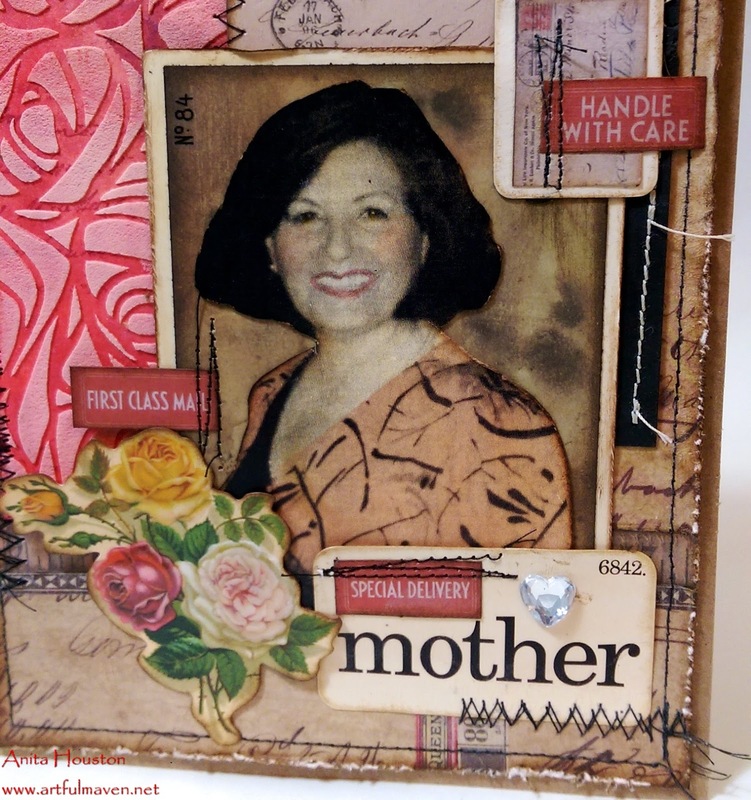 The sewing really adds a nice "mother's homespun" touch to them. 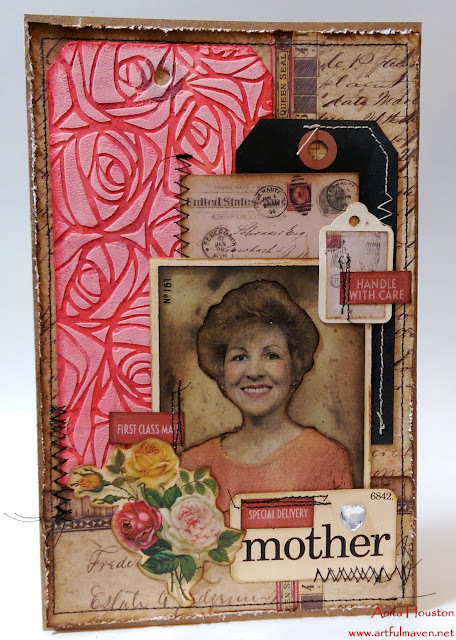 Love the backgrounds and the way you've added your mothers onto the cards. Beautiful! You are truly an artist! These are gorgeous! Love, love love all that you did to these! Fantastic cards to celebrate the mothers on Mother's Day. Love the inclusion of the photos, and the fabulous vintage look ephemera alongside the bold beautiful roses tags. Beautiful! 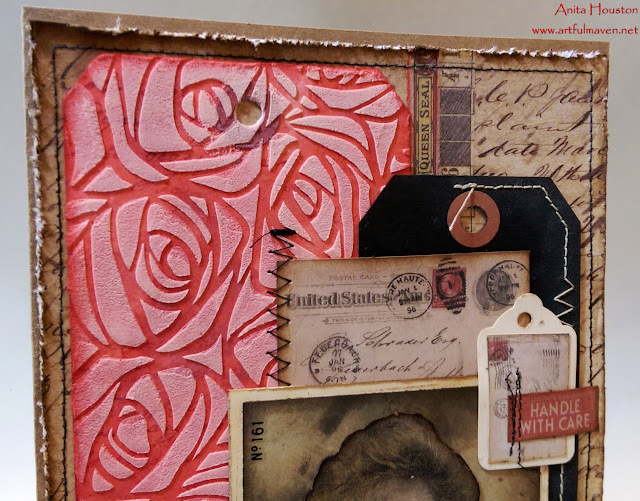 I love all the fun layering of ephemera, as well as the nice touch the stitching adds to the finished piece. Blessings, my friend!